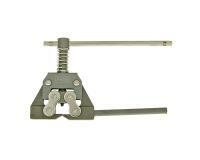 Universal chain tool for 415-632 chains. Also fine for split link chains. Suitable for motorcycles, mopeds, quads etc. Recommended for 520 and up for most comfortable use.